We also went freeway blogging in October, 2009 in Davis. This time we had a totally different experience due to the illegal, unconstitutional and unprofessional behavior of 2 CHP officers. View our 3 part video. You may find it maddening. We did. 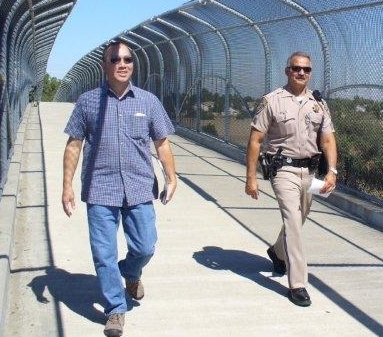 But we ultimately prevailed, getting cooperation of CHP for our freeway blogging peaceful demonstrations. This was the last time that CHP or the Davis P.D. gave us this kind of treatment or anything like it in Davis. In part 2 the problem gets worse. Imagine the thinking and communication that went on with CHP before and during this incident. Well now we are really engaged in half an argument. We want to talk and engage them but they want to play “Let’s show them who is boss” and break the law while violating our rights. Read about our complaint and how CHP followed up on this utter failure of their officers.